JEFFERSON, Ga.— The Jackson County Board of Education sent letters to parents of students in the school system on Monday, Feb. 6, confirming attendance zones for the 2017-2018 school year. The confirmation letters are the culmination of a months-long process by the school board to approve the rezoning and determining the boundaries of the new zones. The rezoning will affect approximately 600 of the 7600 students in Jackson County, most of whom are elementary students. The measure will impact a small number of middle and high school students as well. Benton Elementary School, the oldest facility and the smallest school in terms of enrollment, will close at the end of the 2016-2017 school year. The 230 students who attend Benton will attend either South Jackson or East Jackson Elementary. Three of the Jackson County elementary schools are well below the minimum number of 450 students per school that determines how the state of Georgia funds schools. The closing of Benton Elementary will increase the student population at Maysville Elementary and North Jackson Elementary to within 30 students of the 450 student minimum. If students are entering their last year of elementary, middle or high school, they may choose to remain at their current school next year. Students who are not entering their last year may apply to stay at their current school under House Bill 251 until February 28. Additionally, current Benton Elementary students who do not like their school assignment for next year may apply to attend a different school. 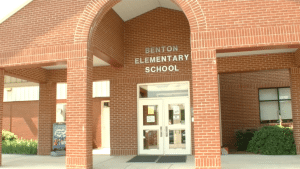 The closing of Benton Elementary was first introduced and tabled in 2014. It was reintroduced and approved by a 3-2 vote in July of 2016. Several hearings followed in August and the decision was reaffirmed by a 3-2 vote in September. Jackson County School Superintendent April Howard attended nine question and answer sessions with parents regarding the changes in attendance zones throughout October and November. The new zones resulting from the closing of Benton were approved at the December Board of Education meeting. Teachers, parents and students at South Jackson and East Jackson held open houses on Thursday to welcome the current Benton students who will attend their schools next year.